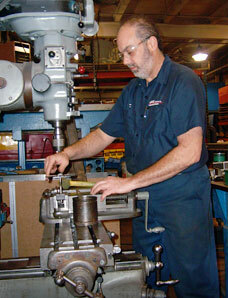 MPE Machine Tool, Inc. service technicians will evaluate your machine tool to determine root cause of machine malfunctions. Whether mechanical or electrical in nature, we have the tools and knowhow to restore your machine to proper running condition. MPE Electrical Repair Services include CNC Control and PLC programming services, On-Site Troubleshooting of all electrical systems, Servo and Spindle Motor Service, Motor Drive Service and Replacement, Scale Service and Replacement, Down-Wire and Re-Wire for Machine Moves and Replacement parts for all major brands including Siemens, Fanuc, NUM, Heidenhain, Allen Bradley, and many more. MPE provides complete machine tool mechanical repair services including troubleshooting, machine tool way grinding or scraping to original OEM specification. MPE also provides mechanical services for hydraulic systems, lube systems, OEM gears, ball screws, ACME screws and nuts and essentially all aspects of your machine.